It’s a well known fact that I enjoy making a big deal out of the little things in life. My kids know to expect unexpected fun and anticipate special occasions even on the most blah “holidays”. For example, May Day. 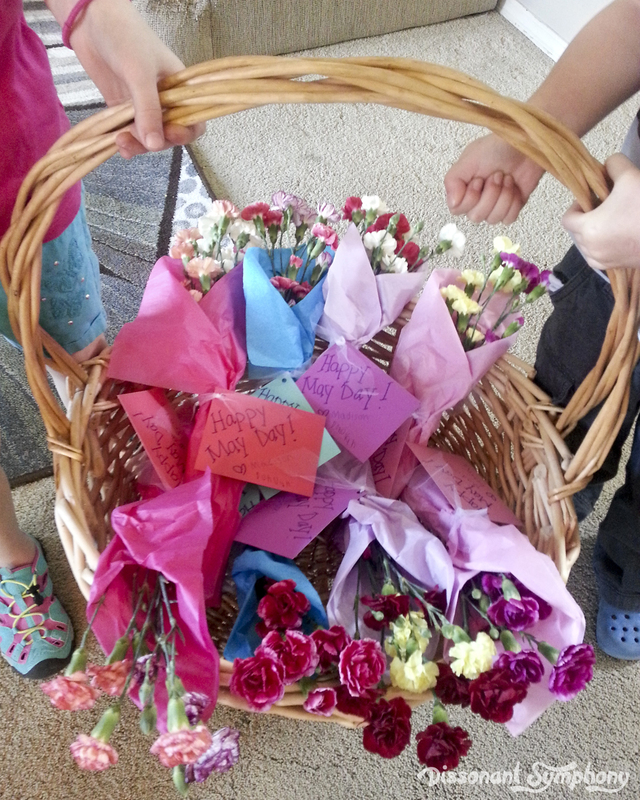 Leaving a basket of flowers and treats used to be a very popular tradition on May Day. The tradition dates at least as far back as Louisa May Alcott writing about May Baskets in her book “Jack and Jill” in the 1800s. Welcoming spring with a special basket/bundle of flowers, ringing the doorbell and running away is rapidly becoming a thing of the past. And that makes me sad. What kind of world is this anyway? I left flowers for my neighbors as a child. My siblings and I even wrote a May Day poem one year to include with our front porch bundles of joy. I wonder if my mom still has a copy of it. I remember it was hilarious. Hmmm. I keep the tradition alive with my own kids now. They love it. Last year, we went crazy with colored tissue paper and coordinating note cards. You can make baskets out of strawberry containers, woven strips of paper, or origami paper. Any container will do. 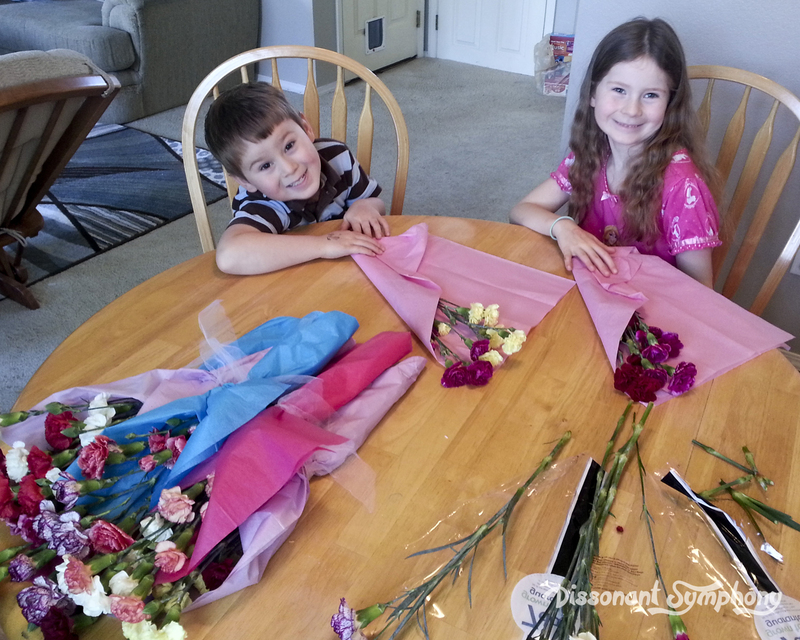 I really enjoy May Day because it lets my kids give to adults. Every other holiday in the year (it seems) consists of adults bringing joy to kids. 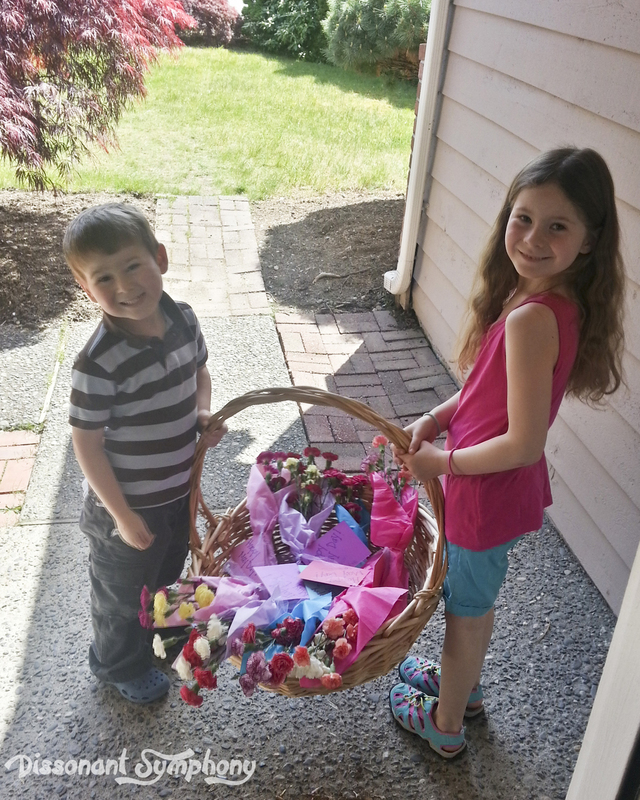 May Day lets my children experience the joy of giving…without expectation of any reciprocation.They head out together and attempt to sneak to the door and run away before anyone catches them. It’s adorable to watch them scurry around the cul-de-sac. May Day is an opportunity to brighten the lives of your neighbors. It doesn’t take much to do so. One year we made flowers out of painted handprints. Ok yes. That was the year I forgot to purchase flowers and it was getting to be afternoon-ish and I was scraping together something without trucking the crew out to the store. Still. Everyone loves knowing someone else thought of them. 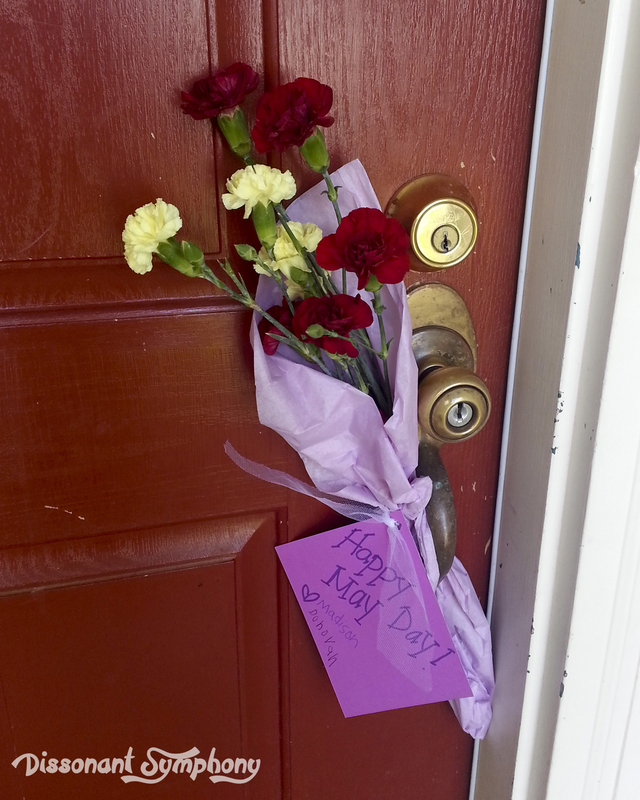 It’s cheery and lovely to get an unexpected bouquet on your door. I encourage you to give it a try this May 1st. It’ll warm the cockles of your heart.